Thinking about going on a long drive in this weather? Before you hit the road, make sure you are prepared for any type of road emergency. Blowouts and flat tires. This is the most basic thing that can hinder your progress and sometimes it just can’t be helped. First, you need to make sure that you have a spare tire that is inflated and in good condition. Also make sure that you have the necessary tools for changing a spare tire like a lug wrench and jack. Don’t forget the early-warning device as well. Speaking of blowouts, if this were to happen at speed, remember: don't panic. Slamming on the brakes can cause your car to fishtail, lose control, and crash. During a blowout, ease off the throttle and gradually slow down by shifting to a lower gear. Don't make any sudden movements at the steering wheel and signal as you pull over to the shoulder. Stalled or overheating engine. An overheating engine is a catastrophic scenario. As soon as the temperature begins to rise you must pull the car over to the side of the road. 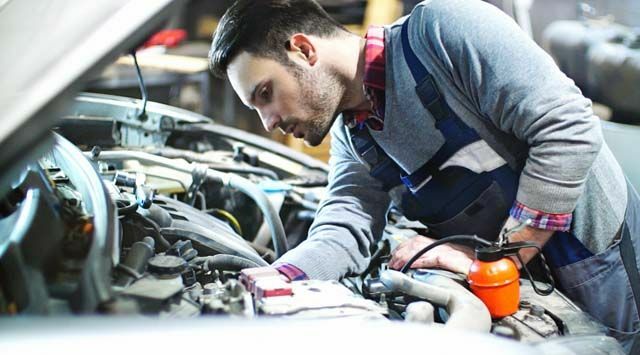 Do not attempt to keep driving because if the engine reaches critical levels, you will run the risk of damaging the cylinder head, valves, pistons, and possibly even the engine block. After you have pulled over, turn off the engine, but do not open the radiator cap while the engine is still hot. What could have gone wrong? Maybe the radiator fan doesn't work anymore, or maybe the cooling system has sprung a leak somewhere. In any case, you must call for help. Collision. What to do? first, make sure that it is safe to step of the vehicle. If you have children on-board, have them stay inside of the car. Try to remain calm as you discuss the matter with the other motorist/s. Make sure that all parties document the positions of your cars. Wait for the police to arrive as they will prepare a police report for your insurance company. Hopefully by then, you and the other party will have reached an amicable agreement. Move both cars to the shoulder so that you don't impede traffic flow, and be thankful that your car was the only thing that was damaged. Road rage. There is plenty of stress when we hit the road, thus altercations are likely to happen. Somebody will cut you off, steal your parking space, or block your way when they counter flow. The trick is to keep calm. Nothing can put a wet blanket on a family vacation more than blowing your top. Don’t set a bad example for your kids by losing your cool in front of them. Just relax. Plus, you never know if the other person is packing a deadly weapon. It’s not worth it to lose your life because of road rage. If someone wants to start a fight with you, do not step out of your vehicle. Calmly drive away. But if the person really wants to engage, we suggest that you drive to the nearest police outpost. Brake fade. This is a fairly common occurrence among drivers who are unfamiliar with the proper techniques when traversing mountain roads—especially during a descent. What usually happens is a driver will ride the brakes for an extended period of time, up to the point that the brakes overheat and braking power is diminished. If the driver continues on this way, what will happen is that more pedal effort will be required to slow the car down. You do not want to reach the point when braking power is lost because of burnt brake pads and boiling brake fluid. This is a recipe for disaster. Avoid this situation by always shifting to low gear (engine braking) when descending to remove strain on the braking system. If your brakes start to fade, the first step is awareness. Pull over to the side of the road and let the brakes cool down. Before going on a trip, it's best to check on the condition of your car. Standard check should be made on the brakes, tires, and all your engine fluids. A trip to a Petron Car Care Center for a free safety check, change oil, or other services will ensure that your ride is road-worthy and ready for a long drive. Don’t take these quick maintenance points for granted. But if ever you need the help, a Petron Value Card will come in handy as it offers free towing in certain situations. A Petron Value Card also affords you earn extra points that can be redemmed as free fuel next time you gas up. For more information about the Petron Car Care Center, click here.